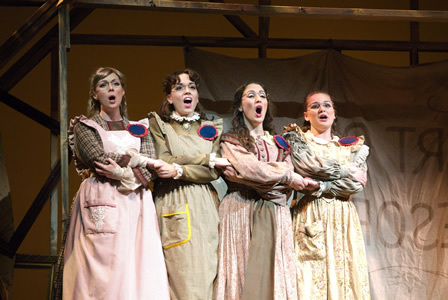 Since it’s 1998 premiere by the Houston Grand Opera, Mark Adamo’s first opera Little Women has remarkably joined the short list of most produced American operas with over twenty productions in the United States and abroad. Summer Opera Theatre Company in residence at the music school of Catholic University has mounted an impressive production with a handsome two-tiered set and good singers who excel at acting. Adamo based his two-act, eight-scene opera on the classic novel of the same title by Louisa May Alcott set during the U.S. Civil War. In Adamo’s version of the story, the tomboyish Jo, one of the four March daughters, is the focus and it is her coming of age tale. The Prologue opens with Jo’s reunion with Laurie, the neighborhood boy she and her sisters grew up with. Although he loved Jo and proposed to her, he has married Jo’s youngest sister Amy. A headstrong young woman raised by enlightened parents, Jo rejected Laurie because she did not want to change the relationship with him. The underlying theme Adamo follows is that things change and one cannot alter the course of destiny. From the Prologue, all of the scenes occur in Jo’s memory until the last scene, which comes back to the day of the Prologue. Those familiar with Alcott’s novel, Director George Cukor’s 1933 film starring Katharine Hepburn as Jo, or the January 2005 Broadway musical with a cast headed by Maureen McGovern as Marmee, mother of the March sisters, know that Little Women is a tear-jerker. Adamo’s opera is no exception, however, the way he sets up the audience emotional reaction is masterful. In Act II, Scene 2, Jo hears from Friedrich Bhaer, the German man she has met in New York City where she has gone to recover from Laurie’s proposal of marriage, a veiled declaration of love. The beautifully nuanced delivery of the aria “You Know the Land Where the Lemon Trees Bloom,” first in German and then in English, by base-baritone Joshua Sekoski as Friedrich is a showstopper. With this aria, Adamo sets up the emotional landscape for the death of Jo’s beloved Beth, the March sister who excels at the piano. Act I presents certain musical challenges that begin with the building of a chord by voices off stage. In Summer Opera Theatre’s production, director David Grindle has put these off-stage voices behind the audience and these voices present with an odd vibrato. The effect is otherworldly which seems to make a statement about what has happened to the March family, but it is also distracting. Early in the opera, Adamo has fun with the soprano voices allowing them a limited measure of vocal gymnastics that give a certain youthful flirtiness to the young sisters. The outstanding acting by mezzo-soprano Jenna Lebher (Jo) and tenor James Biggs (Laurie) as well as the use of surtitles by Summer Opera Theatre adds a lot to the understanding of Act I, which is excessively text heavy. Adamo who is a multi-talented artist known for his ability to wield the English language (he wrote the Little Women libretto) did not do well with setting the text until he got to Act II where the words are pared down. Beth’s song “Have Peace Jo, ” like Friedrich’s aria about lemon trees, offers simple language that allows the music to make its emotional impact. Soprano Kelly Smith as Beth delivers a heart-wrenching performance. Another notable Act II number “She Who Is Down Need Fear No Fall” offered powerful mezzo-soprano performances by Laura Zuiderveen as the cynical Aunt Cecilia and Jenna Lebher as Jo. In terms of writing the libretto for Little Women, what Adamo has done well is produced satisfying dramatic moments. Because the orchestra under the baton of Kate Tamarkin was in a covered pit, the clarity of Adamo’s vocally complimenting orchestration heard June 16 was diminished.